When I was six no one could tell me what I could or couldn’t do (at least that was my thinking back in the day). I was quite the rebel, I was a pirate! I didn’t go on holiday with my family, we couldn’t afford expensive clothes or expensive activities. But it was easy for me to fly away, borne by my grandfather’s words: everything seemed reachable for my tiny hands. In his tales I was a noble pirate on a black ship, with black flags and my Jolly Roger swirling in the wind. Then something changed when I turned 12. I still wanted to be a pirate, but maybe a pirate princess, perhaps wearing a gown. As the years were passing by so my dreams were changing, toning down their nuances and verves. About a month ago I made a short trip to inspire me to write about the beauty of Sardinia’s coastal areas, which are not as famous as our beaches. I was driving surrounded by the fields towards the sea when I saw the “Senzillas,” the lighthouse and defense tower of Chia. I had to stop. It was humid and hot when I walked the path leading to the tower, but the view from there was worth my sweat-soaked new shirt. When I reached the top of the small hill I only saw the reassuring silhouette of the tower and the immensity of the sea and the sky all around me. The colors were the brightest you can find in nature. It suddenly came to my mind that, inside the Chia Tower, had been lying a pirate treasure for centuries. I could hear my grandpa’s voice again and his beautiful tales took me far away once again. Daydreamer is my middle name! Breathing the pure marine air made me feel invincible and powerful, as I had when I was a kid. Ok, maybe it’s not a real pirate treasure. But tourists (and locals) can visit a permanent exposition of ancient coins, paintings and nuragic bronze statues on the wonderful beaches of Sa Colonia and Il Porticciolo, in the coastal area of Domus de Maria. It’s sad that nowadays only 40 percent of the 105 towers can be declared in good shape, thanks to various repairs carried out over the centuries. A very popular tourist destination, this area offers a broad range of hotels and activities suitable for sports and adventure lovers, families or couple with a soft spot for chic and romantic getaways. Just a walk in one of these unforgettable places will bring back your childhood dreams and fantasies, as I experienced myself. After my short trip to Chia, I started a journey to explore all the Sardinian Coastal Towers – a decision that led me to discover new places and emotions I thought were long lost. Sometimes you take your land for granted and it’s easy to forget how much there is out there to explore just as you once dreamed. Not as a fearless pirate, but as a grown-up woman. 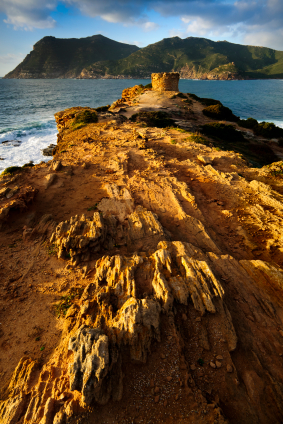 Silvia Pe lives in Sardinia and is an Italian travel enthusiast and compulsive reader. She works in the tourism field for CharmingSardinia.com and runs the blog CharmingItaly.com, in which she shares information about Italy. You can get in touch with her on Facebook, Twitter, Stumbleupon.